Chasmaporthetes is a genus of Hyena, extinct for the better part of the last million years. It's known as the American hyena, a dog-like hyena, and is the only hyena to have made it to North America, having crossed the land bridge over the Bering Strait. Chasmaporthetes was discovered at the turn of the 20th century by a Kansas paleontologist and celebrity fossil hunter named Barnum Brown (named after the circus showman). 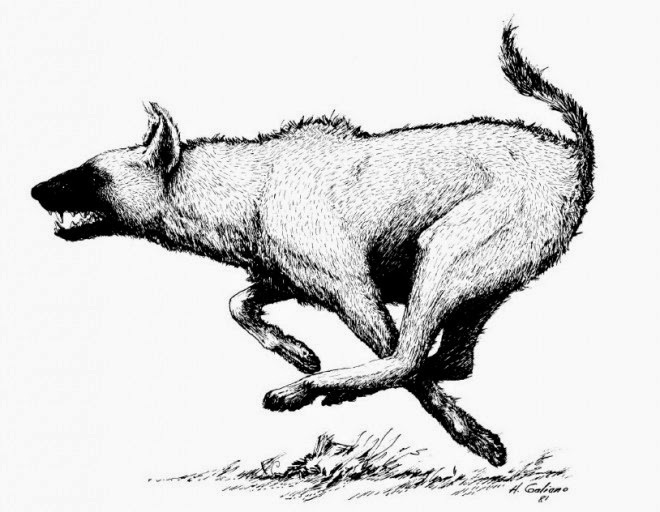 But the hyena was properly identified and named 20 years later by Oliver Perry Hay. Hay was a curator of the United States National Museum, which eventually became the Smithsonian. O.P. Hay gave the American Hyena the scientific name Chasmaporthetes ossifragus. Ossifragus means "bone breaking," which describes something the animal does, namely its bite. But he gave it the peculiar genus of Chasmaporthetes, which means "he who saw the canyon" referring to the Grand Canyon, as Barnum Brown discovered the hyena's bones in an Arizona copper mine. Arguably Hay named the animal in reference to the location where it was found. This is the only of the Hyaenidae genera to migrate to North America, though subsequent species have been found across the globe from Spain to Tibet. I like to imagine, though, that Hay saw in these old bones on his desk a fellow American, an explorer, a feisty dog who got to see the Colorado cut through billions of years of the earth. Perhaps Hays, from just the lower jaw collected by Brown, could trace the form of a running dog, the way our ancestors traced constellations, and imagined his story. Perhaps Hays could imagine this dog on the rim of the Grand Canyon, and see through his eyes a younger and rougher, but still staggeringly deep canyon.